Audience Retention - Are Your Videos Being Watched? 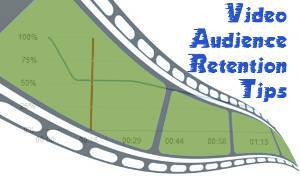 Audience Retention – Are Your Videos Being Watched? 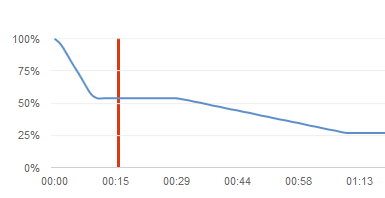 How long are people staying to watch your videos? Are you grabbing the viewer’s interest right away? If viewers are leaving before you even start your messageâ¦ you might want to change what you are doing. You have only 5-15 seconds to grab the attention of the person who clicked play on your video. As you can see in the picture, almost 50% have left before the 15 second mark. That means they are totally board, your video wasn’t what they expected or possibly they all got called away suddenly. Remember that people have the attention span of a gnat on crack. They don’t care so much about you, they want the info or entertainment you said you were giving. People that are on YouTube are not trapped in a room and being “forced” to listen. They have no worry that they may embarrass themselves or the speaker if they get up and walk out. All a video viewer has to do is barely twitch their finger and BAM, they are gone. Once they leave, you may have to work really hard to ever get them back. Or you have to hope you can get someone else to even find you and click the Play button. If you have a long intro and are not giving people the info they came for immediately, they will just click away to another video. Take a really good listen, is your voice just droning away? Possibly you have useless rambling? Are your images so small they can’t see what you are talking about? Is your volume too low and they can’t hear you? Is your music obnoxious or overpowering your message? When we started making videos, we had a 15 second intro and noticed people were leaving before we even got to our message. We then cut down to 10 seconds, even though I thought that would be a winner, it helped but not enough to matter. We then went to a max of 5 seconds and found that we were doing much better. Now, one channel I run, I have intros that are the sole purpose of the videos. The video themselves do not have an important “message“. They are used to get people who are looking for that specific product to click the associated link or type in our site name. They also rank in the SE’s. So, the view time is not crucial as they see the product and know where to get I, in the intro. We also tried using low music throughout the video. We found that it is tricky to please everyone’s taste and some people cannot hear the speaker well with the background noise. So if you want to keep viewers, cut down your intro by simply saying something like your name and what you are answering or showing in that particular video. Yes, get to the meat of your video quick. You can do your branding without wasting time in the intro by using a “watermark” or side logo in your video. If you are doing a Hangouts on Air, use the Lower 3rd app I talked about in How To G+ Hangouts On Air (HOA), because the same rules apply once you place that Hangout on your YouTube channelâ¦it is just another video. Stay on topic, check your volume and images and just try to “liven” it up while still getting your message across. If you are going to talk about yourself, you better be VERY entertaining and have a REALLY exciting life. Otherwise the only people who will watch will be your close family and friends that care. Then you need to check your META! Look at your title, tags and description; do they truly reflect what the video is about? If you have misleading META and think that it is working because people are clicking play, but leaving once the video startsâ¦then your message is not heard. Make sure that the viewer is going to see a video that is what you say it is. Yeah, I wouldn’t count on that being a big factor in people leaving. Nope, they leave because they want to. Sorry! See how to find your YouTube Audience Retention Stats. Let us know what you find in your YouTube Stats, are people sticking around to watch or are they leaving before you even get your message out? Tell us in the comments why you leave a video.